Brian George Roggenbuck of Darrington, Washington passed away unexpectedly early Friday morning, March 23rd, 2018. He was 58 years old. Born to Buck and Louise Roggenbuck of Vashon Island on December 31st, 1959, Brian was an adventurous and outgoing child. One of six children, Brian was often seen around the island with his older siblings, or with his younger brother, Glen, in tow. Brian exhibited a strong work ethic at an early age, picking strawberries on Tok Otsuka’s farm in the summer, holding down numerous lawn jobs, and working weekends at the Doubletree Hotel in Southcenter during the school year─all while building forts and treehouses, riding motorcycles, and working on various cars. He graduated from Vashon High School in 1978, where he was deeply involved in school athletics, with football and baseball being his favorites. Over the decades, Brian continued to support youth sports in a variety of coaching positions. He coached football for Vashon High School, as well as tee ball and little league for elementary students.Brian was a third generation logger who loved the outdoors and heavy machinery of all types. He had a keen business acumen which he leveraged to purchase his own timberland. He refined his trade by acquiring forested properties and selectively logging them to open up views of the Sound or the mountains, resulting in beautiful building sites enjoyed by many families. He was passionately independent, completely self-made, and loved the challenge of his own business. Brian deeply loved animals. At one time, his ranch in Darrington was home to nearly 30 horses, numerous cats and dogs, and a handful of chickens. A favorite cat would often accompany him in the cab of his truck. He was also a voracious reader and had a distinct passion for current events and history. His reading table was often heaped with books about the golden age of flying and logging in the old days, while his iPhone was full of numerous news subscriptions that he read daily. His legion of dollar store reading glasses could be found on every surface of his house. Brian was well known for his wit and incredible sense of humor. He was always eager to strike up a conversation and made connections with people swiftly. For those lucky enough to be counted as a close friend, he would do anything, going to great lengths to help them whenever they needed. He would drive across the state to attend his nephew’s plays, or drop everything, repeatedly, to help a friend rebuild a cabin destroyed by wildfire. Brian was also deeply committed to serving his community. 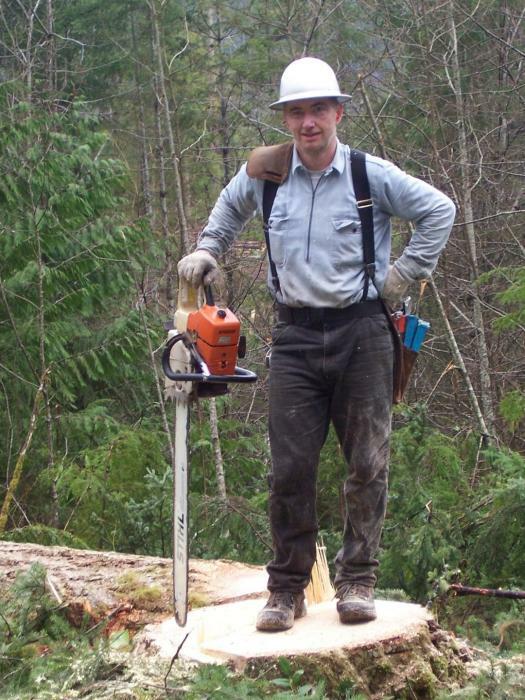 During the Oso landslide in March of 2014, Brian volunteered during the rescue effort and debris removal. He operated heavy machinery alongside FEMA members to extricate victims of the mud catastrophe for 28 continuous days. Those courageous efforts were recognized by President Obama during his visit to the mudslide site. One of Brian’s greatest joys in life was his son, Christopher, whom he raised as a single father. With the help of Brian’s parents, Louise and Buck, his brothers, and family friends, Brian brought Chris up right. Thanks to Brian’s unique and impactful tutelage, Chris developed a passion for business and technology which took him to Yale for college, and to his current role at Google in Seattle. Though he died far too soon, Brian brought great joy to those who knew him. He is survived by his son, Christopher, and his brothers, Lewis, Dennis, and Glen Roggenbuck. Brian was loved and admired by many. He will be remembered as a loving father, a devoted brother, a passionate friend, and a selfless member of the community in times of need. A funeral service will be held to commemorate Brian Roggenbuck on Vashon Island this Saturday, March 31st at 1pm at Vashon Island Funeral Home, located at 18005 Vashon Hwy SW, Vashon, WA 98070. Followed by a graveside service. A reception will follow at Camp Burton.